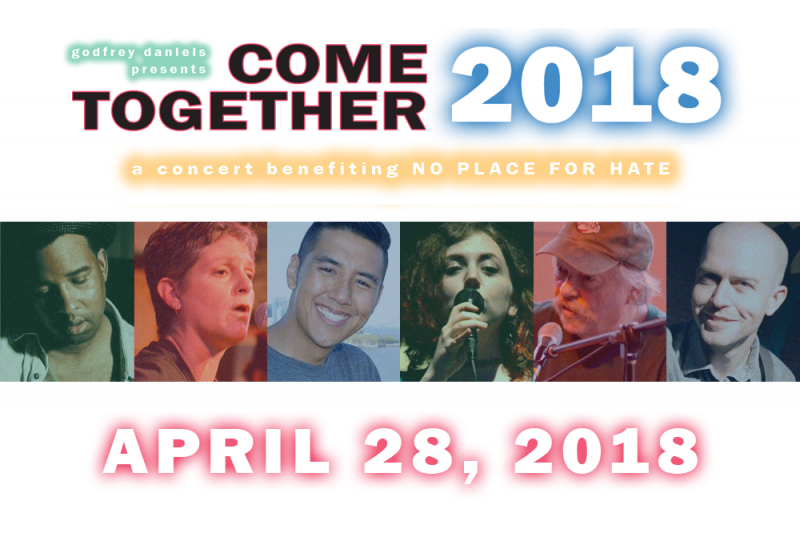 Come Together with Godfrey Daniels and an all-star lineup of Lehigh Valley musicians to raise money and awareness for "No Place for Hate," a program that helps kids figure out how to get along with each other. Our benefit concert on April 28 at Godfrey Daniels in Bethlehem, PA, features Pentley Holmes , Dave Fry , Dina Hall , Alyssa Allen (of the band Soul Folks ), John Huie (director of the World Percussion Ensemble at Northeast Middle School), and Not For Coltrane (Michael Duck). Dr. Jack Silva, Bethlehem Area School District's assistant superintendent and chief academic officer, will also join us to talk about how "No Place for Hate" is used in our schools. But even if you can't come to the show in person, this is your chance to help us raise money and awareness for "No Place for Hate"! The program is an initiative of the Anti-Defamation League and is used in 46 school districts throughout Pennsylvania and many more across the U.S. It aims to help kids reduce bullying, increase their respect for each other, and challenge anti-Semitism, racism, and bigotry in all its forms. Learn more at the ADL website. Please come together with Godfrey Daniels and all our performers, as well as all our supporters at the SouthSide Arts District , Lehigh Valley Underground , Working Dog Press , and Molly's Irish Grille & Sports Pub and show that our community is no place for hate! Get two free tickets to an upcoming show at Godfrey Daniels. Get two free tickets to two upcoming shows at Godfrey Daniels.